I am always lusting over high end brands and never buying... I'm the sort of girl who will add all the things she likes to a basket on the Selfridges website and then dream of clicking the 'checkout securely' button. 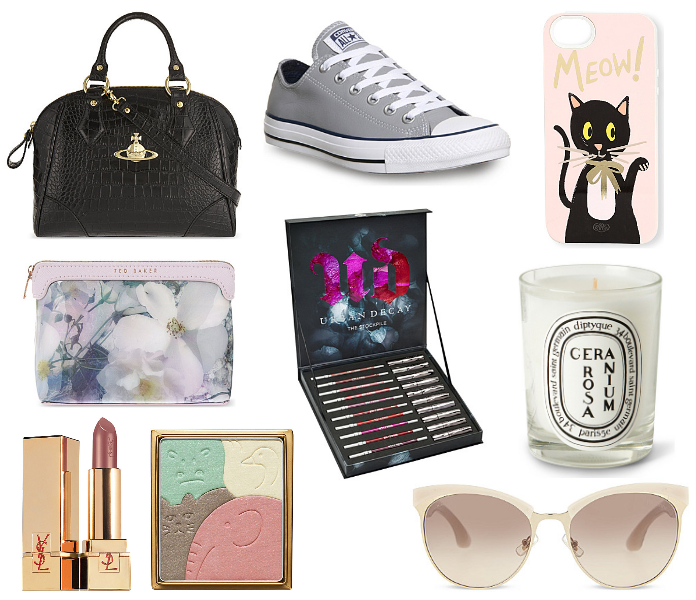 So does someone wants to donate to me £861 for this beyond dreamy wishlist plz? It may be down to the blogger/youtuber hype but I really want to see what the fuss of a Diptyque candle is all about, and I have my eyes on the Geranium Rosa scented candle. I love fruit and floral scents, and this one would please my nose I'm sure. But £40 for something I'm going to burn away doesn't seem to make sense in my mind. I'm loving all these things at the moment and a couple of them are repeats on my wishlists. I know these are all more investment pieces, but I love making these sorts of wishlists so I can look back on at a later date and see if I'm still loving them! Does anyone else do this with their wishlists? Share with me what's on yours at the moment! I love reading other people's wishlists! Aw the meow cat case is so cute! I'm totally swooning give the Paul and Joe eyeshadow palette as well - want!